MINNEAPOLIS — The Minnesota Timberwolves could have used their draft picks in deals to help clear space under the salary cap for potential free agent additions next month. They needed some high-ceiling young players just as much. 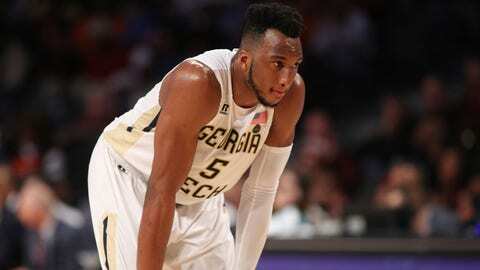 Opting against any deals, the Timberwolves selected Georgia Tech guard Josh Okogie with the 20th overall pick in the first round of the NBA Draft on Thursday night, targeting a tough-minded player with defensive versatility as a primary asset. “Nothing presented itself that would be better than actually selecting at 20,” general manager Scott Layden said. The same went for the 48th overall choice, when Ohio State forward Keita Bates-Diop was still available in the second round. The Big Ten Player of the Year was widely projected as a late first-round pick. Okogie played two seasons for the Yellow Jackets, averaging 16.9 points per game and shooting 43.7 percent from the field. The 6-foot-4, 213-pound Okogie led the Atlantic Coast Conference with an average of 6.8 free throw attempts per game last season, bringing consistent doses of energy and physicality. Born in Nigeria, Okogie grew up outside of Atlanta. He was third in the ACC in 2017-18 with an average of 1.8 steals per game and also grabbed an average of 6.3 rebounds per game. Okogie’s wingspan was measured at the draft combine this spring at 7 feet and his three-quarters-of-the-court sprint time was just 3.04 seconds. With a vertical leap of 42 inches that tied Villanova’s Donte DiVincenzo for the highest at the combine, Okogie is capable of guarding multiple positions, an ability treasured by Thibodeau. Toughness is another trait that assuredly attracted Okogie to Thibodeau, conducting his third draft since being hired in Minnesota. Okogie, who watched the draft with family, friends and teammates in Atlanta, had trouble composing himself when Thibodeau called. Depth at the wing positions was a glaring need for the Wolves this offseason, with no backups set yet for Jimmy Butler and Andrew Wiggins. Jamal Crawford and Derrick Rose are set to become free agents. Perimeter shooting is another priority after Minnesota ranked last in the league with an average of 8.0 made 3-pointers per game. The Wolves were 19th in the NBA with a 3-point shooting percentage of 35.7. With little space under the cap, the Wolves could’ve used their first-rounder in a package to trade away some veteran salary, but the pick was also important as a way to cheaply add a rotation-caliber player. Thibodeau has long favored experience on the court, skimping on time for young players, but Okogie has shown an ability to make catch-and-shoot 3-pointers from the corner that could supplement his defense enough to warrant time in the rotation. “I think I can help from day one,” he said. The Wolves passed on one of the sharpest outside shooters in this draft class, Duke’s Grayson Allen, but took advantage of a rich pool of wing players to snag Bates-Diop, the leading scorer in the Big Ten as a fourth-year senior in 2017-18 at 19.8 points per game. He was limited to nine games as a junior because of a leg injury and took a redshirt for the 2016-17 season. The 6-foot-7, 235-pound Bates-Diop finished his college career as a 47.2 percent shooter from the field.